Charakter: VARIETALS: 90% Sangiovese, 10% Colorino, Cabernet Sauvignon, Merlot. VINEYARDS - Place of production: the grapes for the production of the wine Riserva Ducale predominantly come the vineyards of the Ruffino estates Santedame, Montemasso and Gretole, located in the traditional Chianti Classico production area stretching over the provinces of Siena and Florence. The soil is characteristic for the area with an abundant presence of Galestro rock. The microclimate is variable one area to another which confers richness and complexity of perfumes to the wine. Altitude: Variable 290 to 450 meters above sea level Growing system: Guyot trained and Cordon trained. Vine density: 3000/5000 vines/hectare. "Jeannie Cho Lee" has rated the wine "Ruffino Riserva Ducale, Chianti Classico Riserva DOCG, Italy" the vintage 2008 on 29.11.2012 with 83 of 100 points.
" Simple, soft, easy Chianti for everyday drinking. Moderate length. Tasted in: Hong Kong, China. Maturity: Drink. " "Decanter World Wine Awards" has rated the wine "Ruffino Riserva Ducale, Chianti Classico Riserva DOCG, Italy" the vintage 2013 on 01.01.2017 with 90 of 100 points. "Falstaff Magazin" has rated the wine "Ruffino Riserva Ducale, Chianti Classico Riserva DOCG, Italy" the vintage 2008 on 15.02.2013 with 85 of 100 points. "Wine Spectator" has rated the wine "Ruffino Riserva Ducale, Chianti Classico Riserva DOCG, Italy" the vintage 2007 on 31.10.2011 with 87 of 100 points. "Wine Enthusiast" has rated the wine "Ruffino Riserva Ducale, Chianti Classico Riserva DOCG, Italy" the vintage 2006 on 04.01.2011 with 87 of 100 points. 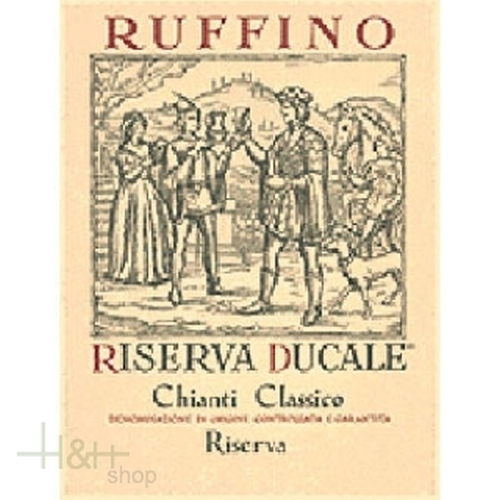 "Huon Hooke" has rated the wine "Ruffino Riserva Ducale, Chianti Classico Riserva DOCG, Italy" the vintage 2006 on 12.05.2010 with 89 of 100 points. "Wine Spectator" has rated the wine "Ruffino Riserva Ducale, Chianti Classico Riserva DOCG, Italy" the vintage 2006 on 15.10.2009 with 90 of 100 points. "Vinum Wine Magazine" has rated the wine "Ruffino Riserva Ducale, Chianti Classico Riserva DOCG, Italy" the vintage 2001 on 01.11.2005 with 16 of 20 points. "Wine Enthusiast" has rated the wine "Ruffino Riserva Ducale, Chianti Classico Riserva DOCG, Italy" the vintage 2001 on 04.01.2005 with 85 of 100 points. "Wine & Spirits Magazine" has rated the wine "Ruffino Riserva Ducale, Chianti Classico Riserva DOCG, Italy" the vintage 2000 on 01.04.2004 with 85 of 100 points. "Wine Spectator" has rated the wine "Ruffino Riserva Ducale, Chianti Classico Riserva DOCG, Italy" the vintage 2000 on 30.09.2003 with 85 of 100 points. "Wine & Spirits Magazine" has rated the wine "Ruffino Riserva Ducale, Chianti Classico Riserva DOCG, Italy" the vintage 1997 on 01.04.2001 with 85 of 100 points. "Wine Enthusiast" has rated the wine "Ruffino Riserva Ducale, Chianti Classico Riserva DOCG, Italy" the vintage 1997 on 04.01.2001 with 89 of 100 points. "Wine Spectator" has rated the wine "Ruffino Riserva Ducale, Chianti Classico Riserva DOCG, Italy" the vintage 1997 on 31.10.2000 with 88 of 100 points. "Wine Spectator" has rated the wine "Ruffino Riserva Ducale, Chianti Classico Riserva DOCG, Italy" the vintage 1996 on 30.11.1999 with 84 of 100 points. "Wine Spectator" has rated the wine "Ruffino Riserva Ducale, Chianti Classico Riserva DOCG, Italy" the vintage 1995 on 30.09.1997 with 81 of 100 points. "Wine Spectator" has rated the wine "Ruffino Riserva Ducale, Chianti Classico Riserva DOCG, Italy" the vintage 1993 on 31.10.1996 with 82 of 100 points. "Wine Spectator" has rated the wine "Ruffino Riserva Ducale, Chianti Classico Riserva DOCG, Italy" the vintage 1990 on 28.02.1995 with 84 of 100 points. "Wine Spectator" has rated the wine "Ruffino Riserva Ducale, Chianti Classico Riserva DOCG, Italy" the vintage 1989 on 30.04.1994 with 83 of 100 points. "CellarTracker" has rated the wine "Ruffino Riserva Ducale, Chianti Classico Riserva DOCG, Italy" the vintage 1969 with 93 of 100 points. "CellarTracker" has rated the wine "Ruffino Riserva Ducale, Chianti Classico Riserva DOCG, Italy" the vintage 1985 with 91 of 100 points. "Stephen Tanzer" has rated the wine "Ruffino Riserva Ducale, Chianti Classico Riserva DOCG, Italy" the vintage 1997 with 90 of 100 points.